Service Cards and Holders are a cost effect solution to keep your customer informed about when their vehicle is due for a service. The card is printed 2 Sided with service details on in facing side and dealer advertising on the out facing side. 350gsm card is used as standard. The adhesive pouches are made from durable PVC vinyl ensuring the pouch will not need to be replaced at every service. This product is fully customizable to suit your individual requirements and branding can be included as required. 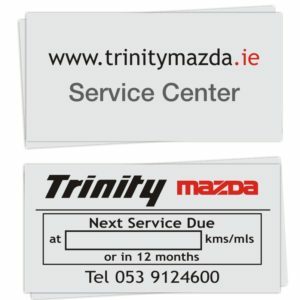 Service Stickers are an excellent solution to keep your customer informed about when their vehicle is due for a service. 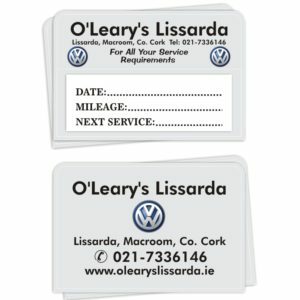 The sticker is printed 2 Sided with service details on in facing side and dealer advertising on the out facing side as standard. Single Sided options are also available. It is manufactured using high quality vinyl and is fully opaque on both sides. This product is fully customizable to suit your individual requirements and branding can be included as required. 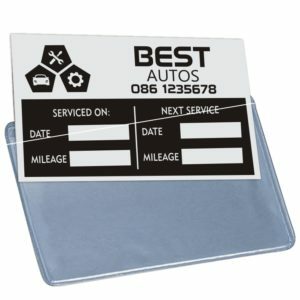 Service Wallets are an excellent solution to keep your customer informed about when their vehicle is due for a service. The wallet is printed 2 Sided with service details on in facing side and dealer advertising on the out facing side. The adhesive pouches are made from durable PVC vinyl ensuring the pouch will not need to be replaced at every service. Each order of service wallets are supplied with 220gsm card inserts where service details can be filled in. This product is fully customizable to suit your individual requirements and branding can be included as required.